Few things can be more frightening than a crash involving a school bus. If the school bus is full, there is the possibility of injured children in addition to injured drivers involved in the collision. Here are 3 ways to avoid a school bus accident, and what to do if you or a loved one were involved in a school bus accident that may have been caused by a negligent driver. Speed limit signs are present for a reason, especially in school zones. School buses can pull out en masse from the parking lot when they’ve loaded the children and are ready to proceed on their routes. Always obey speed limit signs in school zones not only to avoid an accident, but also to avoid getting a double fine for speeding. Getting stuck behind a school bus with numerous stops on its route is frustrating, but resist the temptation to pass the school bus while it is stopped, even if its lights aren’t flashing. A school bus usually only stops when it is loading or unloading children, and you run the risk of either causing an accident with the school bus itself or being involved in a pedestrian accident where a child has been struck by your car. Play it safe and stop when the school bus stops, even if it’s costing you extra time. When a school bus is going slow, it can be tempting to tailgate and drive close to the back of the school bus. However, this can potentially cause an accident if the bus makes a sudden stop. Instead, keep a safe distance between your car and the bus, roughly one car length for every ten miles per hour that you are driving. 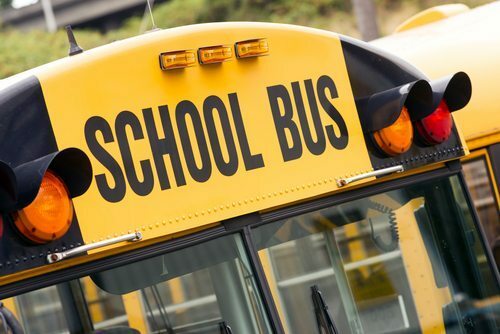 If you or a loved one have been injured in a collision involving a school bus, it’s critical to investigate the accident as soon as possible to determine if the crash could have been caused by negligence. At Appalachian Injury Law, we have the expertise and resources to help hold the person responsible for the collision legally liable for the accident. Contact a car accident lawyer at Appalachian Injury Law today by calling (706) 515-1995 or (678) 319-9991.